How do you organize your bookshelves? Do you read fanfic? What are some of your favourites? I played them more when I was younger, but I’ve since lost interest. My younger brother, though, is OBSESSED with them. I’d say that my favourites were some of the Mario Kart and Super Mario games, along with this one iCarly game (I was in love with the show at the time). I had a DSi of my own and sometimes played with my brother on the Wii. Give us a bookish confession? I have told you guys the fantasy one so many times, so this time I’ll confess that I can’t listen to music while I read. It needs to be completely silent. Some say that music enhances concentration, but for me I just find myself distracted. What blog post(s) are you most proud of? Do you collect any bookish merch? If so, what? Hogwarts house, Illvermony house, and patronus? Who is your favourite avenger and why? I have zero interest in superheroes so I don’t have one, sorry! What book do you wish you could have/would have read as a kid? 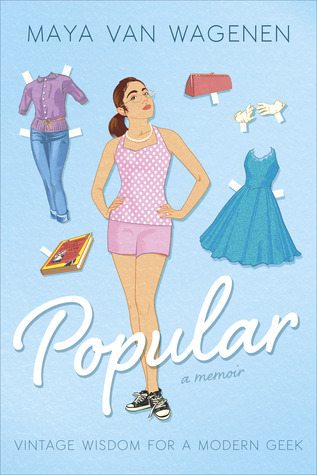 I feel like I would have benefited if I had read Maya Van Wagenen’s memoir Popular when I was a tween. I really wanted to be popular and I didn’t fully understand what the term meant, so had I read her book then I would have been educated on the topic and thus been able to comprehend popularity more. What inspired your love of reading/books? Seeing as I have loved reading for as long as I can remember, my inspiration was probably genetics. My grandmother loved to read and I think she passed the trait down to me. 1. Where was the last place you travelled, and when was it? 4. What was the last movie you saw in theatres? Did you enjoy it? So tell me, do you dis/agree with any of my answers? How would you respond to my or Sam’s questions? Let me know in the comments below. Thank you and you’re very welcome!💗This was a scheduled post so I don’t think you’d changed the link yet when I wrote it, so I’m sorry about that! i went to tim hortons for the first time a few months ago and honestly…i fell in love. great post!! Haha, thanks so much!💞 What do you usually get from Tim’s? I can’t listen to music while I read either. I’ve had friends which created playlists for while they read, but I always get waaaaay too distracted, too! And I know, right?! I don’t understand how they do it!